As told in Part One of the “Historical Look at the San Bernard”, an amount of $500 was requested by Capt. C.S. Riché, Corps of Engineers in Fort St. Philip, La to be used for a survey of the San Bernard River. What follows is that survey by the Assistant Engineer, Mr. S.M. Wilcox. The San Bernard River rises in Fayette County, Tex., and flows in a southerly direction between the counties of Austin and Colorado, Fort Bend and Wharton, and through the western portion of Brazoria County. The river lies about halfway between the Brazos and Colorado rivers, passing within about 5 miles of the Brazos, near Latonia, and during the last 30 miles almost paralleling it, finally emptying into the Gulf of Mexico about 12 miles west of the mouth of Brazos River. The country through which it passes is one of the most fertile river bottom, and including the rich grazing lands along the coast, the fertile river bottoms, and the fine farming lands of middle and western Texas. An 1894 photograph of three hunters, one on horseback, far left, and two sitting on the ground with one holding a rifle, Deer and bear hanging from a rack. 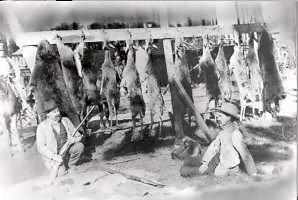 This was the result of a deer hunt, displayed in the Velasco Hotel yard, Velasco, Texas, near the San Bernard River. Image courtesy of the Brazoria County Historical Museum. The river is crossed by but one railway, the New York, Texas and Mexican (construction started 1881), near the town of Kendleton, about 60 or 70 miles in an air line above the mouth. A new line, the Cane Belt Railway, is proposed and partly under construction, and will probably cross the river near the New York, Texas and Mexican crossing. 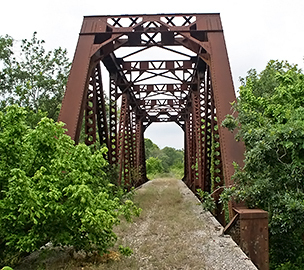 Still standing is the old Cane Belt Railroad bridge over the San Bernard, located just upstream from F.O.R.’s conservation easement west of Guy, Texas. Construction of the railway was started in November 1898 and service discontinued in 1967.